Zingala's Workshop: And, now for # 10! And, now for # 10! Is everyone still breathing? Can you believe that next week at this time it will be Christmas Day!!! The season has gone by so quickly. But, it's so nice of you to stop by here to check out my latest tag in the 12 Tags of Christmas Funkie Junkie style. Welcome to all of you! Well, I have to say that I loved Linda's tag # 10! You can see it here. 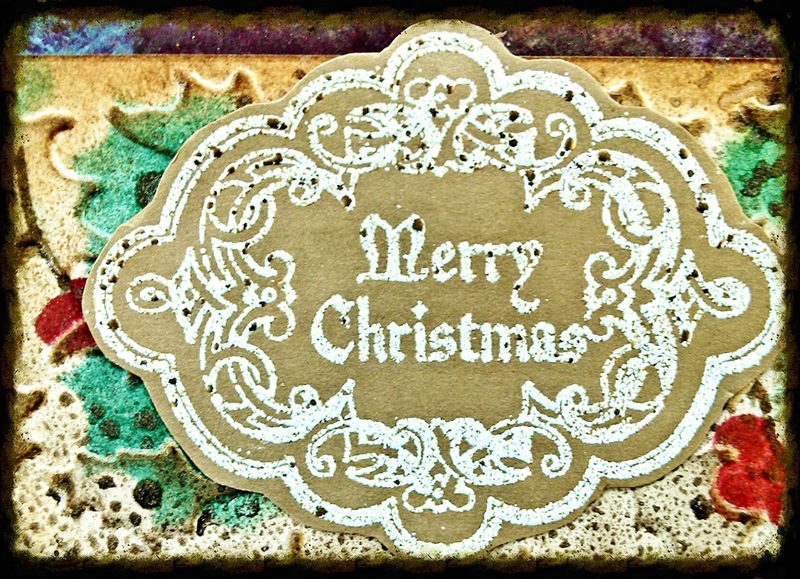 She used the holly embossing folder for the background and also Tim's new holly stencil. Holly is one of my favorite holiday symbols and I use it a lot. 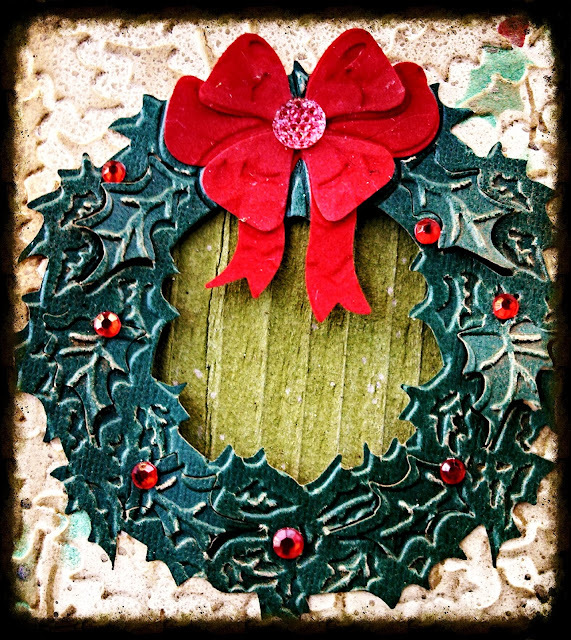 I took my inspiration from the holly motif that she used and also the frame featuring the greeting. I did change it up a bit though. Here is what my tag looks like. I started out with a number 10 tag and used the sized circles die to cut a circular hole in the center. Since I didn't have the same embossing folder that Linda used I used an all over holly design folder. I randomly stenciled some holly on the tag then ran it through the embossing folder. Using my finger to apply it, I lightly rubbed gold Gilder's Paste over the raised areas. A spritz of gold Perfect Pearls spray finished the background. For the wreath I used Tim's holly wreath die. I have been wanting to find a project to use it on and this seemed perfect since I was featuring holly. Once it was cut using a dark green kraft core paper, it was run through the coordinating embossing folder. The bow was cut with red flocked paper that was in my stash. The wreath was glued down to the cut out circle and I put some stick on red stones around the wreath and a sparkle dot in the center of the bow. The message at the top of the tag is a greeting stamp that I stamped with clear EP on gold CS and then used Stampendous Vintage Ivory embossing powder to emboss it. I cut two holly leaves with an old Sizzix die and attached them at the bottom with some stick on red stones. That finished my tag. Here are some details. There you have it. This challenge is great fun and Linda has extended it by adding two more tags with a deadline extension to January 8th. The randomly selected prizes are gift certificates to The Funkie Junkie Boutique, which is the sponsor of the challenge. Wow and wow again! This came out fantastic, Maryanne! Your background is sensational and that wreath - fabulous. I'm drooling over the way it looks with the red rhinestones and red flocked bow! Really gorgeous take on my #10 tag! Thanks for sharing with us. Family has gone out for the afternoon so a few moments to do some blog hopping... this tag is phenomenal!! Like Linda said, the back ground and wreath look amazing and I love the bright colours you have used for yours, makes it look so festive! Love it! I like the background, it really has its own interest but still lets the wreath stand out. This one could possibly be my favorite! The holly wreath is fantastic, right down to the gilding on the leaves, this is just beautiful! What a fabulous tag - I love gilder's paste and have a small collection of colours - I've never achieved anything near this gorgeous with it though - it's beautiful!